, an Italian of very uncommon talents and learning, was born at Alexandria, in the duchy of Milan, about 1420. His family name was Merlani, which he exchanged for Merula. He was the disciple of Philephus, and taught polite literature at Venice and at Milan for forty years, and laboured with great success in restoring and correcting ancient authors. Jovius calls him “Grammaticorum exactissimus,” the most exact of grammarians and Erasmus, in his “Ciceronianus,” represents him as a man, who translated the Greek authors with a dignity and elegance sufficient to rank him with many of the ancients. He died at Milan in 1494. 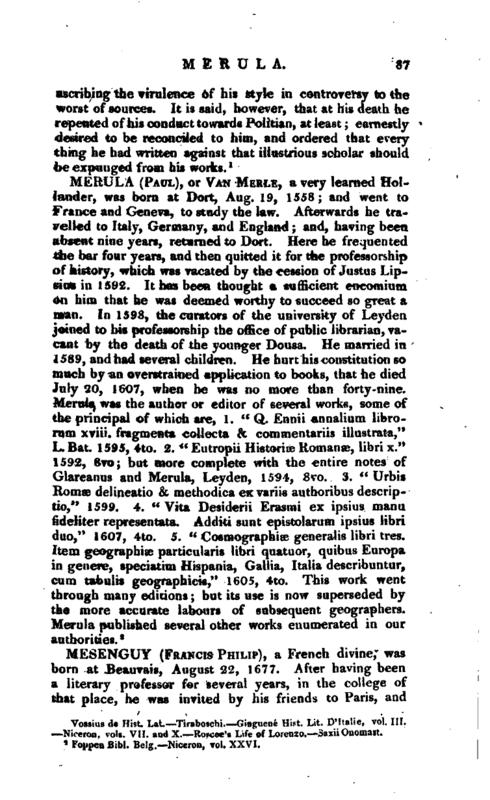 His original works are of the historical kind, the most distinguished of which is his “Antiquitates Vicecomiturn, lib. X.” fol. without place or date, but printed at Milan about the beginning of the sixteenth century. This only extends to the death of Matthew, whom the Italians are accustomed to call *' the Great.“The style is pure, but he has adopted too many of the fabulous reports of the old chronicles, and is in other respects incorrect as to dates and facts. 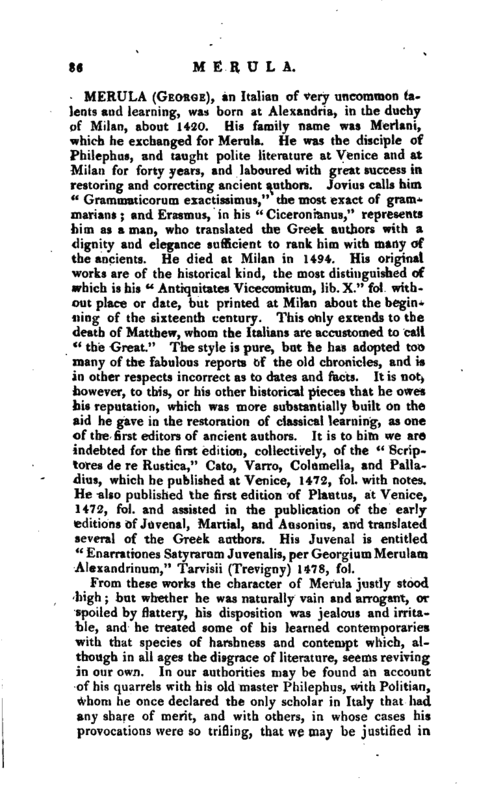 It is not, however, to this, or his other historical pieces that he owes his reputation, which was more substantially built on the aid he gave in the restoration of classical learning, as one of the first editors of ancient authors. It is to him we are indebted for the first edition, collectively, of the” Scriptores de re Rustica,“Gato, Varro, Columella, and Palladius, which he published at Venice, 1472, fol. with notes. He also published the first edition of Plautus, at Venice, 1472, fol. and assisted in the publication of the early editions of Juvenal, Martial, and Ausonius, and translated several of the Greek authors. His Juvenal is entitled” Enarrationes Satyrarum Juvenalis, per GeorgiumMerulam Alexandrinum," Tarvisii (Trevigny) 1478, fol. Vossius de Hist. Lat. —Tiraboschi Ginguene Hist. Lit. DMtalie, vol. III. —Niceron, vols. VII. and X. Ro?cee’s Lite of Lorenzo. —Saxii Onomast.